Formula One’s best videos are their compilations of team radio transmissions from each race. We hear these on the broadcast, but it’s fun having a highlight reel. The team radio is where F1 drivers drop their PR-friendly veneer to unleash the full spectrum of human emotion. Disappointment! Snark! Swearing! Glee! Last weekend’s Bahrain Grand Prix gave us a new classic from ultra-frustrated McLaren driver Fernando Alonso. Any initial sense of politeness about Honda’s turd of an engine in the too-slow, too-fragile McLaren has long disappeared from Alonso’s mouth even out of the car, and that brutal honesty only gets turned up to 11 on the team radio. Alonso: [Bleeped], he was what, 300 meters behind us on the straight? McLaren engineer: Fernando, we’re considering Plan B. How are the tires? Alonso: Do whatever you want, man. Alonso’s total resignation to the fact that nothing will make the McLaren competitive is no doubt a catchy line on par with Kimi Räikkönen’s infamous “Leave me alone. I know what I’m doing.” I’m sure I’m going to hear “Do whatever you want, man” from F1 fans regarding futile situations for years to come. 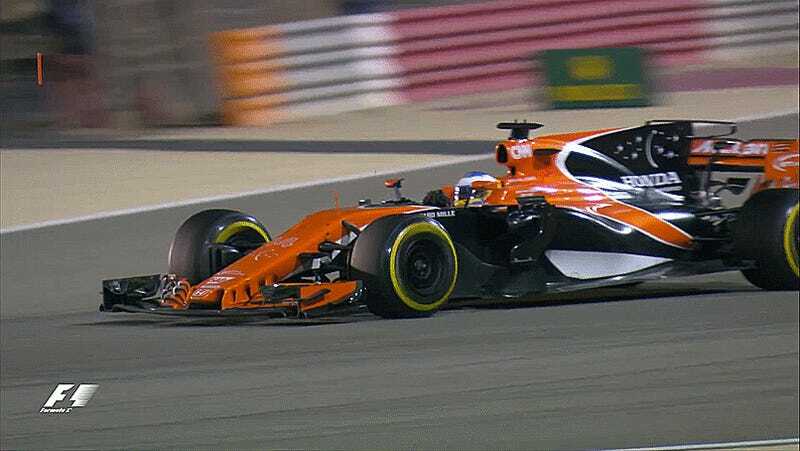 The situation was as futile as Alonso made it out to be, as he was forced to retire with an engine problem two laps before the end of the race. What’s your favorite F1 radio transmission of all time?